“Secrets become powerless in the open air,” says a character in Anil’s Ghost (2000), Michael Ondaatje’s novel set in the midst of Sri Lanka’s long civil war. It is a truism that powerful figures in Sri Lanka, accused of human rights abuses and war crimes, should ponder. Five years after the war’s end, secrets are indeed being exposed to the open air, secrets written in bone. Just before Christmas, laborers laying a pipeline in the northern district of Mannar unearthed a mass grave dating from over a decade ago. In November 2012, construction workers did likewise in the central district of Matale, this one dating from the late 1980s. Both were the legacies of two very different insurgencies on an island that often seemed a paradise, a teardrop off India’s southern tip. And both rebellions had active North Korean support. Coming to Sri Lanka for the first time in mid-1995, I experienced what I imagine most Westerners raised at cold latitudes experience: sensory overload. Dawn typically came as a slow seepage of mauves and pinks, tropical birds squawking from silhouetted trees. The days could blaze or be moist and vaporous. The greenness of the countryside was overwhelming. Locals smiled constantly and requested (read “demanded”) they prepare you a meal in their homes. But there was also the troubling sense that something dark lurked there too, shifting in the undergrowth. In 1995 the NGO where I was volunteering took me to Matale, not far from the recently unearthed grave. Central Sri Lanka is largely inhabited by the Sinhalese, the majority Buddhists, while in the north and east, the largely Hindu Tamils predominate. Locals would relate in hushed tones how, just a few years before, the surrounding paddies and villages had been the stronghold of a Sinhalese guerrilla group called the Janata Vimukti Peramuna (JVP) or National Liberation Front. Committed to a back-to-the-land communism that drew worrying parallels with Cambodia during Pol Pot’s Year Zero, the JVP had launched uprisings in the southern and central sectors of the island in 1971 and 1989-90. The first uprising was said to have had North Korean backing: the Sri Lankans reacted by closing the DPRK Embassy in the capital, Colombo, and ordering out 18 staff. Pyongyang also had a hand in Sri Lanka’s other major insurgency, the even longer and more brutal campaign to carve away a separate state for the island’s Tamil minority in the north and east, fought by the Liberation Tigers of Tamil Eelam (LTTE), or the Tamil Tigers. The JVP and the Tamil Tigers operated at opposite ends of Sri Lanka. Both organizations drew their membership exclusively from one ethnic group and both had undergone an ideological migration: after making Marxist noises (less pronounced in the LTTE’s case) in the early days, both the JVP and Tigers were soon driven by a messianic, racist nationalism. And although they never clashed and held each other in mutual disregard, the JVP and LTTE had strangely symbiotic relationship. The aftermath of the JVP uprising in 1971 saw a slew of draconian security measures and populist laws enacted, aimed at appeasing the rural Sinhalese nationalists who formed the group’s support base. Their main effect was to push many Tamil youths towards militant groups, such as the LTTE, who advocated separatism. Within a few years of the Tamil war erupting, the Sri Lankan government attempted to solve the separatist issue by hammering out a devolution package and ceasefire, to be monitored by the Indian Army. But the Tigers pulled out of negotiations and attacked the ceasefire monitors, spurring the Indians into launching a major counter-insurgency operation. To Sinhalese Buddhists, the very presence of these Hinduist troops on Sri Lankan soil was an affront. Thanks to the Tigers, they were now fighting a war there. Capitalizing on anti-Indian sentiment, the JVP launched a second insurrection against the government, this one dragging on for three years. In all of this North Korea was there for its clients, be they Sinhalese or Tamil, with money or weapons. By mid-2009, with the Tigers destroyed and the JVP reconstituted as a parliamentary party, perhaps 100,000 Sri Lankans were dead. In the torpid heat of Colombo, the crowd fizzed with aggression. It was July 2002 and I had not long returned from the LTTE-controlled Northern Province, temporarily open to Westerners in the wake of another ceasefire. The JVP activists marching down the streets brandished banners, inveighing against “imperialist” meddling in the nation’s sovereignty. A short distance behind them, shirts, slacks and saris gave way to lengths of saffron cloth and shaven heads. To Buddhist hardliners, even an autonomy package – cited by many as the only antidote to separatism – was and remains a sacrilege. The 2002 ceasefire, brokered by Norway, ultimately lapsed into renewed war. But the presence of so many bikkhus (monks) on the streets that day was telling. For all its socialistic rhetoric, the JVP of today is not the same entity as existed in the 1970s and 1980s. The relationship between Sri Lanka (then Ceylon) and North Korea was a brief one. In May 1970 the strongly left-wing Sri Lanka Freedom Party (SLFP) won a decisive electoral victory. 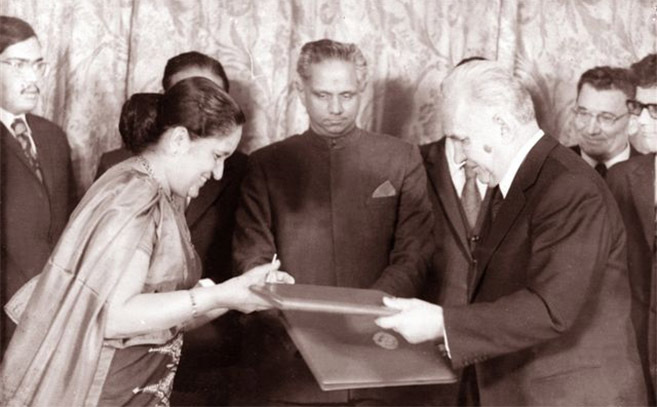 The SLFP was led by Srimavo Bandaranaike, who had become the world’s first female premier in 1960. The SLFP is the major player in Sri Lanka’s current ruling coalition. A new dynasty, the Rajapaksas, calls the shots these days. But then as now, a strong pro-China stance was evident in SLFP foreign policy. In 2006-09, Chinese military and diplomatic support was crucial to the obliteration of the LTTE. In 1970 Bandaranaike’s victory was good news for the DPRK. North Korea was by then mending its fences with Maoist China, following the diplomatic schizophrenia that had characterized the previous decade, when Kim Il Sung’s loyalties flipped between Peking and Moscow. With Chinese help, the North Korean trade delegation’s Colombo office was allowed become an embassy in June 1970. At the same time, the Bandaranaike government recognized East Germany and the Provisional Revolutionary Government of South Vietnam. The new mission chose to refine the art of foreign diplomacy in a strange way. Despite its socialist economic program, the SLFP was regularly harangued from further left by several small Marxist factions. At least some of the embassy staff had meetings with the most radical of these: the JVP had emerged in 1967 following a split in the traditional Ceylonese left. Its leader Rohana Wijeweera was the son of a Ceylon Communist Party activist who had been assaulted in the 1947 election, a year before independence from Britain. He won a scholarship to Moscow’s Patrice Lumumba University but when the CCP split into rival factions, Wijeweera sided with the pro-China faction and was refused a visa to re-enter the Soviet Union. Wijeweera visited North Korea soon afterwards and was in touch with the DPRK trade delegation upon returning to Colombo in 1966. 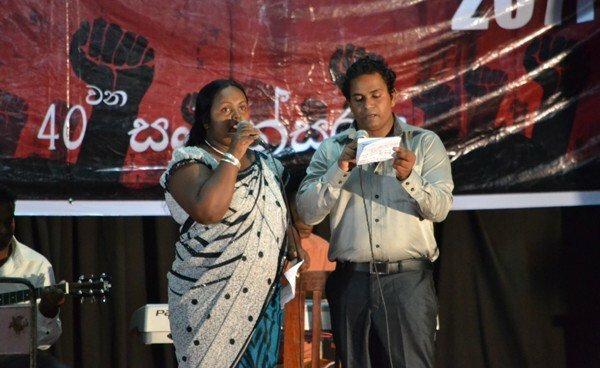 The JVP recruited a network of cadres through its “Five Classes.” Conducted surreptitiously, these were intended to provide a narrative for revolution. In an era of rising unemployment and prices, Wijeweera planned a “scattered and sudden” struggle culminating in the “One Day Revolution.” Despite the obsessive secrecy of the JVP, however, the authorities somehow got wind of the insurrection and, in March 1971, they arrested Wijeweera and around 4,000 of his followers. On April 5, the remaining cadres decided to go ahead with the rising. All over Ceylon JVP cadres attacked police stations, mainly with homemade weapons. Within three weeks the uprising had been crushed. Given almost unlimited emergency powers, the police and army jailed around 18,000 JVP sympathizers and killed around 10,000 people, even though the number of cadres still at large was no larger than around 2,000. The Indians and Pakistanis, despite being mere months away from war with each other, sent in troops and helicopters to augment Ceylon’s security forces. Bandaranaike was able to call on British and Soviet military equipment and aircraft. If, as her government maintained, the North Koreans wanted to arm to the JVP, Indian protection of the air and seaports precluded this. It was also believed that thousands of dollars had been funneled to the JVP via the Embassy, even if the caliber of JVP weaponry was poor. But an abundance of North Korean literature, including the works of Kim Il Sung, was recovered from JVP camps and safe houses. This hardly seems surprising. Much of Juche, the North Korean Holy Grail of triumphal xenophobia, echoed Wijeweera’s vision. Like Pol Pot and Kim Il Sung, Wijeweera was a racial supremacist, extolling the purging of, and vigilance against, “corrupt” foreign influences. Wijeweera was tracked down and killed in November 1989, in the culmination of a government crackdown even bloodier than the one that followed the 1971 rebellion. Until then he had functioned as part folkloric hero, evading the authorities, part ideologue and would be national savior, a Great Leader of the jungle. It is not entirely clear why North Korea would seek to destabilize Ceylon so soon after Bandaranaike’s government recognized the DPRK. In 1971 Indira Gandhi aligned India with the Soviet Union while in Washington Richard Nixon and Henry Kissinger, soon to enter into a “strategic partnership” with China, elected that year to “tip the balance” in favor of their murderous client General Yahya Khan, whose armies were brutalizing the emergent nation of Bangladesh. Then again, logic has never seemed to be the Kim Dynasty’s strong point. Last year’s nuclear saber-rattling may have caused irreparable damage to relations with China, the regime’s only friend. If, to quote the usual simile, the two nations are “as close as lips and teeth,” Communist Party apparatchiks in Beijing may have long ago come to see Pyongyang’s first family as a bad case of gingivitis. Perhaps back in April 1971, Kim Il Sung was enthused of mayhem for its own sake. In any case, the Sri Lankan authorities took no chances. On April 12, 1971 staff at the Colombo DPRK Embassy were taken into protective custody. Two Sri Lankans who worked for the embassy were also temporarily detained: Premalal Kumarasiri, a former Communist Party MP who had sided with the pro-China faction and HMP Mohideen, a former director of the Ceylon Broadcasting Corporation. On April 16 Ambassador Hwang Yung Wu and 17 staff were seen off at Katunayake Airport by his Chinese counterpart. A Soviet plane took them to Pyongyang via Moscow. The following month, the media reported that the Indian Navy had impounded two North Korean trawlers that were carrying weapons, supposedly en route to Colombo Harbor. In July 1974 a four-man trade delegation visited Colombo. Led by Sok Jim Kim, North Korea’s Deputy Trade Minister, the group met briefly with the Sri Lankan Trade Minister. A request to pay a courtesy call to Bandaranaike’s residence was rebuffed. The following year, the prime minister’s son Anura flew to Pyongyang for an attempted rapprochement that included a three-hour audience with Kim Il Sung, but the DPRK Embassy was never reopened. Forty years on, the JVP had renounced armed insurgency – but not its admiration for North Korea. “Comrade Kim Jong Il who, like his father, foresaw the imminent threats for the security of the Democratic People’s Republic of Korea and its people from imperialists and their lackeys, built an invincible military strength,” reads the eulogy of Somawansa Amarasinghe on behalf of the JVP Central Committee, following the Dear Leader’s death two years ago. While the party’s International May Day resolution offers “unconditional support to North Korea,” the JVP was never likely to procure North Korean weapons after 1990. But Pyongyang was soon to find even more fearsome customers. Tom Farrell is a freelance journalist who has published in several national Irish newspapers.